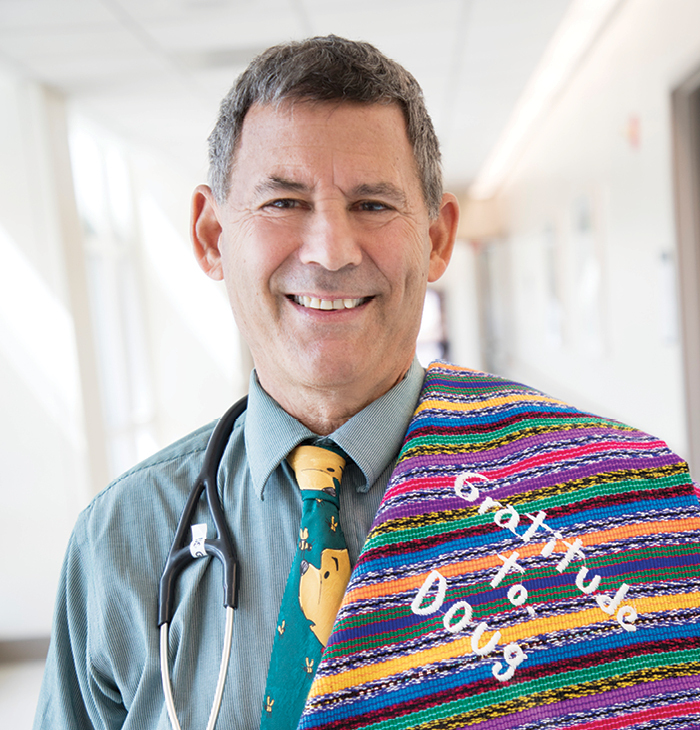 During a week-long medical mission to Guatemala, Doug Gross (M.D., ’90) received this hand-woven blanket as a thank-you gift from a woman in a Mayan community. Devoted physician, professor and international medical volunteer Doug Gross (M.D., ’90) is the new president of the UC Davis School of Medicine Alumni Association. When he stepped off the plane, the sight immediately took his breath away and an overwhelming feeling rushed through him. The view of devastation and destroyed infrastructure was completely panoramic. He was in unfamiliar territory, and one thing ran through his mind — survival. As he made his way through the city he could see tent villages spread throughout the landscape, and people being transported in the back of pickup trucks to receive medical care. Through all this destruction there was help, but more importantly hope. And it was at this point in the aftermath of the 2010 Haiti earthquake where it became obvious that this — working as a disaster relief volunteer — was where he was supposed to be. Pediatrician, humanitarian and highly recognized UC Davis professor and alum Doug Gross (M.D., ’90) has always been motivated to make change, and has done so by devoting over 40 years to medicine, teaching and community involvement. To date that dedication has taken him to more than a dozen countries and led to international program and policy roles within the UC system and the United Nations. To me it’s not work, it’s an unbelievable experience to do what you love. It’s really special to be a part of both worlds. And UC Davis has always been supportive of me. Gross began his career as an anatomy professor, spreading knowledge to thousands of future physicians and volunteering in a program for developmentally disabled children. Inspired by the work and driven by his passion to connect with children, he decided to pursue a medical degree in pediatrics, and enrolled as a student at the UC Davis School of Medicine. From here, his dual career as a professor and a pediatrician would open many doors, not just locally but internationally. 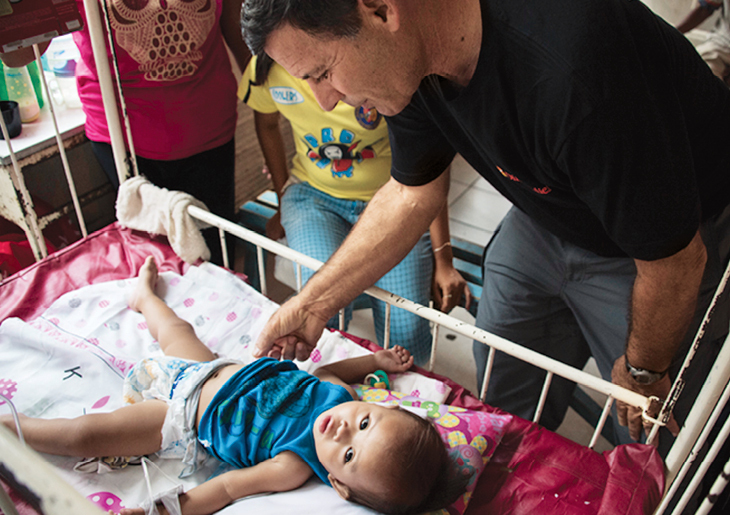 Doug Gross (M.D., ’90) provided care for children in a local church after Typhoon Haiyan struck the Philippines. Recognized for his expertise and commitment to providing care to the underserved, Gross has dedicated years in disaster response and is a member of California’s federal Disaster Medical Assistance Team. He has served with disaster teams during the aftermath of the Haiti earthquake, Hurricane Maria in Puerto Rico, Hurricane Katrina in the U.S., and Typhoon Haiyan in the Philippines, in each instance providing medical care and helping victims with recovery. After his experiences in Haiti, Gross realized that trained medical professionals and resources were scarce in that nation, one of the poorest in the Americas. Upon his return he established the University of California’s Haiti Initiative, a collaborative system-wide program involving the State University of Haiti and all 10 UC campuses. The supportive partnership not only helped Haitian patients receive high-quality care, but also provided much-needed medical equipment and supplies, spurred social innovation in the country, and reinforced the need to enhance the capabilities of the next generation of Haitian health care workers. In Africa, I cared for a baby with cerebral palsy and the mother was staring right at me. What hit me was she is no different than any other mother anywhere — she just wants the best that she can do for her child. Everybody everywhere wants the same things, and we can help with that. Gross has also worked extensively as a pediatrician in Africa and Central and South America, not only training health care workers in those countries but also providing care in remote villages with little or no access to medical services. The impact of others’ gratitude, the look of happiness from a healthy child, and the need to bridge the health care gap in poorer countries have always kept him motivated and resilient in his work to reduce health disparities around the globe. Recognizing that pediatric care needed to be more accessible in underserved countries, he began working with the World Health Organization and became a consultant to help develop and assimilate the U.N. agency’s Integrated Management of Childhood Illness program. This initiative, designed to help health care workers identify and manage the most common causes of death, illness and disability among children under five years of age, has been adopted in several nations. Doug Gross has visited more than a dozen countries to help bridge the health care gap in poorer nations. During a trip to Africa, he partnered with other local doctors to provide care for schoolchildren in rural Kenya. Throughout his career he has experienced meaningful journeys, established connections, and changed the way health care is provided around the world, which has led Gross to give back to the place where it all started — the UC Davis School of Medicine. He said his roles as a UC Davis Health professor and a board member of the UC Davis School of Medicine Alumni Association have provided him with many opportunities to not only support his alma mater, but also to be a part of an ongoing legacy, which he finds extremely rewarding. This fall he will become president of the association, and continue to build bridges with others to increase engagement and alumni participation, support student life, and raise scholarship funding for others to continue their education.